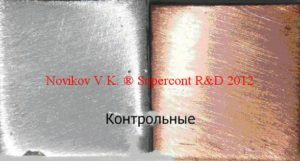 Testing of the «Supercont Grease» was conducted by «Promyshlennaya Elektrotekhnika», 21-2 Gzhatskaya Street, St. Petersburg, Russia, 195251, in their laboratory of welding and gasketed electrical contacts. «Promyshlennaya Elektrotekhnika» is the official developer of Russian State Standarts for gasketed electrical contacts. While thoroughly testing the «Supercont Grease», it was determined superior by effectiveness to all known similar products in Russia and abroad. to 350 oC (662 oF) with grease «Supercont SKM» The organic matrix is not destroyed.